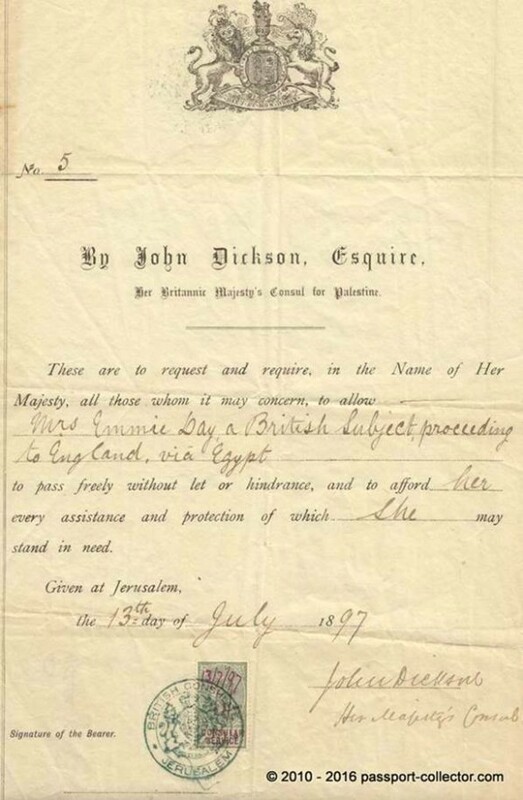 This is an outstanding and significant British passport issued and hand signed 1897 by the BRITISH CONSUL JOHN DICKSON, ESCQUIRE IN JERUSALEM, which was Palestine then but still under OTTOMAN RULE (till 1914), then after the Great War in 1920 it became BRITISH PALESTINE under the League of Nations approval. Such documents are very rare. The condition is excellent. The passport number is 5 and it’s mid of the year 1897! Clearly not many passports have been issued! Born 1847 in Constantinople, son of Dr. Edward Dickson and Louisa Dickson (née Warrington). Served Levant Consular Service. Vice-Consul, Mosul, 1872-76; Vice-Consul, Beirut, 1877-82; Consul, Damascus, 1882-90; Consul, Jerusalem, 1890-1906. Married, 1874, Edith Wills – 3 sons (including H.R.P. Dickson) and 3 daughters. Died 1906 in Jerusalem. Dickson served also as political officer in KUWAIT when it was still a British protectorate! He started his Consular Service already at age 26 (Source) The British National Archive keeps several documents in a John Dickson Archive. Ottoman Palestine consisted of two administrative areas. There was the autnomous Sanjak (district) of Jerusalem which was subject to the High Porte in Constantinople. The Sanjak included an area from Jaffa to the River Jordan in the East and from the Jordan south to the borders of Egypt. The other area was part of the Willayat (province) of Beirut. This part was composed of the Sanjak of Balka (Nablus) from Jaffa to Jenin, and the Sanjak of Acre, which extended from Jenin to Naqura. The administration of Arab territories was entrusted to elected Administrative Councils. Those Councils were elected and existed in the provinces, districts, and sub-districts. Those Councils were vested with extensive powers in administration, finance, education, and development.